The high efficiency Common-Slot Power Supply is a key technology in the HP Thermal Logic initiative. 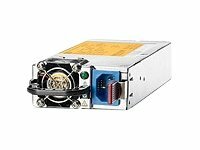 HP Common-Slot Power Supplies share a common electrical and physical design that allows installation in G6 server platforms that have a common-slot power supply bay. HP offers high efficient power supply which allows you to choose the right size power supply for your specific server configuration. HP offers a 1200W Platinum level, 94% efficiency power supply enabling you to reclaim more power and start utilizing it better to run more equipment with the infrastructure you already have. If your infrastructure uses less power, you can unlock lost capacity while also saving money.